Team USA enjoyed the opening ceremonies last night, and a practice race today in the heaviest breeze yet (15-20) since we arrived on Dec 26. Just under 200 sailors (43 girl teams and 58 boy teams) are here in sunny and hot BA, traveling in from about 20 countries from all corners of the globe. Team USA is 3 boats, all from LISOT (Megan/Caroline, Claudia/Amanda, and Reinier/Spencer, coached by Dave Hughes, who's doing a great job getting this fairly young team ready for their first 420 worlds. 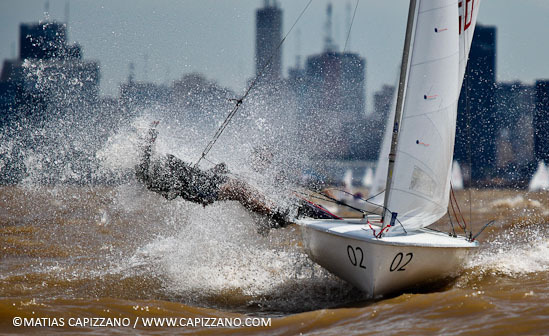 Matias Capizzano was out taking his always amazing pictures in the great sailing conditions. Claud/Amanda and Reinier/Spencer spent many hours over the 3 practice and measurement days getting their new Nautivela boats fitted out, measured and race ready. Megan/Caroline did the same with a locally chartered J-boat built boat. The largest teams, besides a good group from the host country, are from GBR, GER and ITA.